This critique is a modified extract from chapter 2 of the The New Answers Book: 25 Top Questions On Creation/Evolution. Because of the increasing popularity of the framework hypothesis, I highly recommend that you read the concise and helpful “Is Genesis poetry / figurative, a theological argument (polemic) and thus not history?” If you desire to do a little more reading, you can also ready my “A Critique of the Framework Interpretation of the Creation Week (Part 1 of 2)” and “A Critique of the Framework Interpretation of the Creation Week (Part 2 of 2)” (also if you have a chance check out my regularly updated current creation news, which is found on my “resources” page). “One of the most conspicuous obsessions in our culture is the quest for physical beauty. Concern about what we look like pervades our social relationships and seduces us all, men and women both, to some degree or other. The typical impact of culture is like the effects of air pollution: what you inhale tends to slowly and steadily alter you. Our culture besieges us with voices that comment on what we look like, what we ought to look like, and the blessings and curses that presumably attend success or failure. Our mass media culture silently beguiles us with images of the same,” as David Powlison begins his insightful article. I only have a few days left to enjoy our Thanksgiving vacation. My wife and I have spent most of this time in Glendale, AZ visiting my son, Bob, and his family along with my youngest son, Joshua, and his wife, Krysten. While on this trip, I have visited Southeast Valley Baptist Church, pastored by DBTS alumnus Joel Tetreau, in Gilbert, AZ and Tri-City Baptist Church in Tempe, AZ. 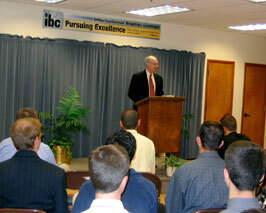 I also had the privilege of visiting International Baptist College, a ministry Tri-City Baptist. My visit to International Baptist College provided me the opportunity to interact with Dr. Michael Sproul (Pastor of Tri-City Baptist Church and Chairman of IBC’s Board of Trustees), Dr. Jerry Tetreau (Chancellor), and Professor Michael Riley (Acting Academic Dean and Dean of Men), to mention a few of the good people at IBC. Since Michael had been one of my students at DBTS, it was an additional blessing to interact with him about life at IBC and his doctoral work at Westminster Theological Seminary. The picture above was taken of me when I spoke in IBC’s chapel on Wednesday morning, November 21. I preached on Psalm 19:1-6 and connected it with three lessons from Romans 1:18-25. The thesis of my message was that the works of God indisputably declare his glory to all people. Speaking at IBC was one of the many highlights from my trip. 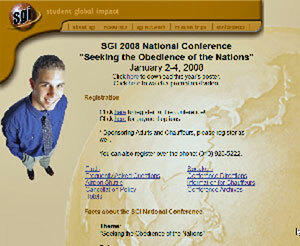 The SGI National Conference, a ministry of Inter-City Baptist Church in Allen Park, MI, is a conference that seeks to enlarge students’ vision of the cause of missions. The 2008 conference will be hosted at Inter-City Baptist Church. The theme for this conference is “seeking the obedience of the nations.” For a brief introduction to the this conference by Dr. Mark Minnick, click on the SGI video. After looking at the video, check out information on the conference at Student Global Impact and make plans to attend. On my October 31 post, “Praise God for Fundamentalists: Desiring God Blog,” I drew your attention to Dr. John Piper’s post “Praise God for Fundamentalists.” In this short article, he expresses his appreciation for the 2005 FBF resolution “On the Ministry of John Piper.” In my opinion, Dr. Piper’s brief article is worth noting on three accounts. First, Piper notes that the FBF’s resolution accurately reflects a few areas where there is disagreement. Second, Piper has some sense of respect for fundamentalism. As a fundamentalist, I have occasionally been disappointed because it seems that we are at times ignored as something of a “lunatic fringe.” In this regard, Piper’s article was refreshing to read. Third, Dr. Piper’s article reflects a humility that we should strive to have when appropriately criticized. Though I am not a member of the FBF and am unfamiliar with many of their other resolutions, I had read this one with great interest because I understood that one of DBTS’s graduates, Michael Riley (currently completing a PhD in apologetics at Westminster Theological Seminary and Acting Academic Dean at International Baptist College in Tempe, AZ), had written a foundational article prior to the FBF meeting entitled “On the Ministry of John Piper.” This article became the basis for the FBF’s 2005 resolution and was printed in the July/August 2005 edition of FrontLine magazine (for a presentation of the some of the criticisms to Professor Riley’s article along with his responses, see his blog). When I initially read this FBF resolution and after reading it again a few days back, I am convinced that FBF resolution was accurate and well-written. It praised Dr. Piper’s theological orthodoxy and overall ministry in stressing a God-centered view of salvation and life. In addition, it stated a few areas where the FBF disagreed with Piper. In my estimation, the FBF resolution hit a bull’s eye. The point of this post is to call your attention to an October 31 post by Michael Riley. This post contains a letter that he wrote to Dr. Piper. The significance of his letter is that it provides some personal background to his foundational article for the 2005 FBF resolution; and it, at the same time, reflects a healthy appreciation for the contribution that Piper’s writing ministry has made in the theological development of Michael Riley, as well as many other young fundamentalists. It is well worth your time to read his letter.